Buddy Punching is when a coworker clocks in for another employee. Buddy punching makes it appear that an employee arrived earlier or left later than they actually did. Usually one employee is running late and they ask another employee to clock in. The late employee hopes that their manager or supervisor won’t notice they aren’t there yet. Sometimes buddy punching is used for large chunks of time or entire days that aren’t worked. 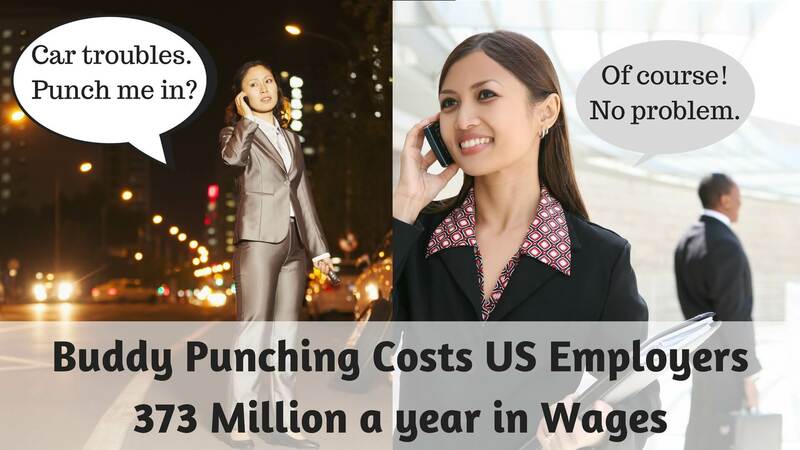 In 2017, research showed that U.S. employers lost 373 million dollars to buddy punching. It’s a form of wage theft and it takes specific tools to stop buddy punching. Buddy punching is most easily done when an employer uses manual timekeeping or punch cards. That makes it easy for an employee to either “log” in wrong hours or for a coworker to punch a buddy’s card. However, even time clocks with codes allow buddy punching as these codes and passwords are often shared for buddy punching purposes. In one survey by Pollfish of 1,000 employees 16% admitted to punching in for a coworker. The study asked employees to voluntarily admit to buddy punching. However, there were likely more employees who were not willing to admit to their buddy punching activity. Buddy punching affects 75% of businesses according to the APA. It costs employers an average of 2.2% of their total payroll according to Nucleus Research. In fact, according to the American Payroll Association (APA), employees admit to stealing an average of 4.5 hours per week. That’s the equivalent of an extra 6 week of vacation a year. Not all of those 4.5 hours are due to buddy punching. Some of that time is due to overestimations of hours worked on manual time cards and underestimation of break times. Either way, employers can reclaim those stolen hours. Employers can help to reduce buddy punching through proximity swipe cards. While it doesn’t eliminate the possibility of buddy punching, it does reduce it. Employees who are running late to work are less likely to have planned for buddy punching by leaving their card with a coworker. Proximity cards or key fobs must be near the time clock and are individual to each employee. They must be near the time clock when the employee punches in. Biometric time clocks can use numerous methods. They require the individual characteristics of each employee to identify the employee. When biometric clocks are used, the employee has to be physically present. This eliminates buddy punching. Iris or retina scans work like a fingerprint and are just as an individual. Face scans measure the features of the face of the employees. These types of time clocks are more costly and are often more than many employers want to spend. One exception is when security is integrated with biometrics. More commonly used is fingerprints or hand scans. Fingerprint biometrics scans the surface of the finger and will often use various points on the fingerprint to identify the individual. Swipeclock’s fingerprint biometric clocks use a hash against the fingerprint characteristics. The fingerprint is then erased and only the hash is used to identify the individual. Fingerprints cannot be recreated from the information and hash stored. This ensures that personal biometric information is not compromised. Hand geometry biometric clocks measure the size and length of the hand and fingers. These clocks do not scan the surface of the hand. Because of this, they are allowed under New York State Labor Law. While biometric clocks do prevent buddy punching, they do not prevent employees from clocking in and then running back out to their car for personal items. One way that employers lose time to employee theft is when employees claim that they forgot to log into the time clock. Employees must then estimate their arrival time and this opens the employer for additional mistakes in employee time. SwipeClock’s automatic notification will send an alert to employees when they are scheduled for a shift and they have failed to clock in. This eliminates the human error of forgetting to log in. Notifications can also go out to managers to notify them of open punches. This helps to eliminate employees forgetting to punch out. As an added advantage, notifications can also go out as employees approach overtime thresholds. This can help managers to eliminate overtime expense. Even with biometric clocks and notifications and alerts, employees can still steal time. Creating an employment policy around time stealing is necessary to curtail wage theft. When a transgression occurs, make sure to deal with it promptly. It is much easier to correct paychecks while still in the paycycle. Dealing with violations also helps to curtail the spread of wage theft. Although a warning might be sufficient for a first time violation, subsequent violations should have a stricter enforcement. Even small employers lose time and money from buddy punching. However, that isn’t the only way that labor expenses are wasted. Employees often estimate early their arrival times and estimate breaks to be smaller than they were. In addition, manual time cards take up unnecessary hours. Employees spend an average of 15 minutes a week filling out time cards. This time can be eliminated with SwipeClock’s automatic timekeeping system. Payroll and HR admin also spend many hours fixing errors and manually calculating time. This increases the chances for human error, which costs companies between about 2.2% of their payroll expense. In addition, SwipeClock’s workforce management tools helps managers to accurately schedule employees for peak times and reduces unnecessary employee labor. Lastly, employers can better stay compliant with other labor laws, sick leave laws, and secure scheduling ordinance. Swipe Clocks’ workforce management tools and employee self service portal help employers with this. Written by Annemaria Duran. Last updated on January 8, 2018.